An inspiring look at the historic foreign policy triumph of John F. Kennedy's presidency--the crusade for world peace that consumed his final year in office--by the "New York Times" bestselling author of "The Price of Civilization, Common Wealth, "and" The End of Poverty"
The last great campaign of John F. Kennedy's life was not the battle for reelection he did not live to wage, but the struggle for a sustainable peace with the Soviet Union. 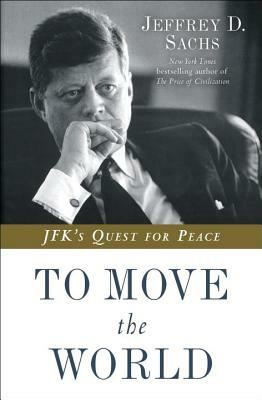 "To Move the World" recalls the extraordinary days from October 1962 to September 1963, when JFK marshaled the power of oratory and his remarkable political skills to establish more peaceful relations with the Soviet Union and a dramatic slowdown in the proliferation of nuclear arms. Kennedy and his Soviet counterpart, Nikita Khrushchev, led their nations during the Cuban Missile Crisis, when the two superpowers came eyeball to eyeball at the nuclear abyss. This near-death experience shook both leaders deeply. Jeffrey D. Sachs shows how Kennedy emerged from the Missile crisis with the determination and prodigious skills to forge a new and less threatening direction for the world. Together, he and Khrushchev would pull the world away from the nuclear precipice, charting a path for future peacemakers to follow. During his final year in office, Kennedy gave a series of speeches in which he pushed back against the momentum of the Cold War to persuade the world that peace with the Soviets was possible. The oratorical high point came on June 10, 1963, when Kennedy delivered the most important foreign policy speech of the modern presidency. He argued against the prevailing pessimism that viewed humanity as doomed by forces beyond its control. Mankind, argued Kennedy, could bring a new peace into reality through a bold vision combined with concrete and practical measures. Achieving the first of those measures in the summer of 1963, the Partial Nuclear Test Ban Treaty, required more than just speechmaking, however. Kennedy had to use his great gifts of persuasion on multiple fronts--with fractious allies, hawkish Republican congressmen, dubious members of his own administration, and the American and world public--to persuade a skeptical world that cooperation between the superpowers was realistic and necessary. Sachs shows how Kennedy campaigned for his vision and opened the eyes of the American people and the world to the possibilities of peace. Featuring the full text of JFK's speeches from this period, as well as striking photographs, "To Move the World" gives us a startlingly fresh perspective on Kennedy's presidency and a model for strong leadership and problem solving in our time. Praise for "To Move the World"
"Rife with lessons for the current administration . . . We cannot know how many more steps might have been taken under Kennedy's leadership, but "To Move the World" urges us to continue on the journey." --"Chicago Tribune"
"The messages in these four speeches seem all too pertinent today." --"Publishers Weekly. Jeffrey D. Sachs is a world-renowned professor of economics, leader in sustainable development, senior UN advisor, bestselling author, and syndicated columnist whose monthly newspaper columns appear in more than one hundred countries. He is the director of the Earth Institute at Columbia University and Special Advisor to UN secretary-general Ban Ki-moon on the Millennium Development Goals, which are designed to reduce extreme poverty, disease, and hunger, a position he also held under former UN secretary-general Kofi Annan. Sachs directs the UN Sustainable Development Solutions Network on behalf of the secretary-general. He has received many honors around the world, including the Sargent Shriver Award for Equal Justice, India's Padma Bhushan award, Poland's Commanders Cross of the Order of Merit, and many honorary degrees. He has twice been named among the hundred most influential leaders in the world by "Time" magazine.